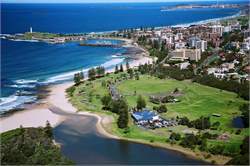 Leave Sydney, the Harbour City for the great surf and aquatic activities of Wollongong and Shellharbour, and continue to historic villages and lush country to Nowra. 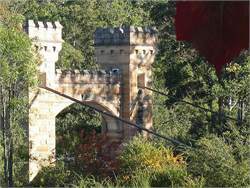 It's an easy drive from Sydney, with lots to see along the way. Turn off into the Royal National Park - the world's second-oldest - which marks the beginning of Grand Pacific Drive, a spectacular stretch of coastal road that takes you through beautiful rainforests and impressive driving scenery with close proximity to sheer cliffs and the South Pacific Ocean. Here you can hire a row boat and take a picnic on the Port Hacking River, visit picturesque beaches or enjoy some of the many great walking trails. Exit the park at Bald Hill- a magnificent lookout and popular hang-gliding site and continue your journey across the Sea Cliff Bridge- the 665 metre over-the-ocean bridge. Stop off and explore Northern Wollongong, famous for its unspoilt beaches and rock pools, unique art and crafts, fishing and surfing and many terrific cafes and restaurants. From hear make your way to Wollongong offering countless adventure activities, more great beaches, shopping and an array of local local cuisine. Wollongong is also a great place to stay with a huge mix of options including international hotel brands, quaint and unique B&B's and backpacker accommodation. 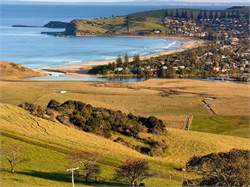 Shellharbour is popular with water sports enthusiasts and includes Lake Illawarra, plus the famous local surf spot The Farm in Killalea State Park. Further south is Kiama, a picturesque fishing village famous for its Blowhole; a natural spout fed from the sea below that can shoot a stream of water up to 60 metres high. Shoalhaven Heads is at the southern end of historic Seven Mile Beach, which was used as a runway for aviator Sir Charles Kingsford Smith on the first commercial flight from Australia to New Zealand in 1933. These days however, the beach is a favourite destination for sun-worshippers, surfers and beach fishing. The nearby historic village of Berry offers fantastic shopping and is a great place for a pub lunch or Devonshire tea. Take a detour from Berry to view magnificent Kangaroo Valley, listed by the National Trust as the principal area of outstanding natural beauty in the region. 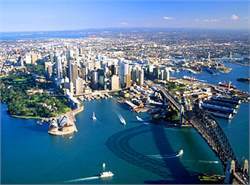 It is also home to a historic village filled with art and craft shops selling local work, restaurants and the famous heritage listed Hampden Bridge, Australia's last surviving wooden suspension bridge. You can also enjoy canoeing on the river, horse treks or bush walks. Then return to Nowra via Cabewarra Lookout where you will find one of the longest panoramic vistas in Australia.